These super thin synthetic fibers feature a tapered tip for tying a natural looking insect feelers and tails. Can be used for thorax patterns as well as nymph legs. The finest synthetic dubbing available. Great for small to medium sized nymphs and dries. An all-purpose antron fiber. Great for posts on dry flies and many other uses. 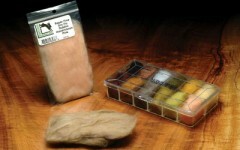 Bronze grade provides the best value for your fly tying dollar. These are perfect for tiers who tie large quantities of flies. Similar quality to Silver Grade but has less feathers.